While in Houston TX. to attend a convention on reparations I began receiving phone calls, text and email messages describing a situation back home in New Orleans. It appeared that juniors and seniors at Walter L. Cohen walked out of school on Thursday October 4, 2012. 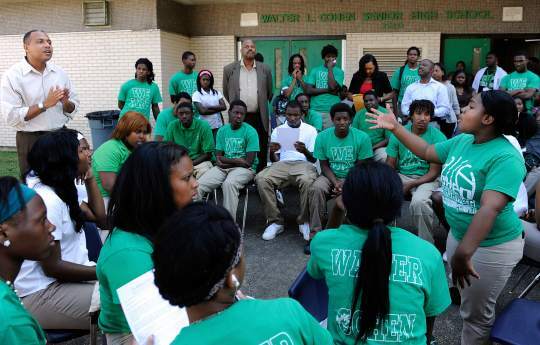 Students say they are “Tired of the lies and misrepresentations” of New Orleans Recovery School District (RSD) administrators and Future is Now (FIN), a national charter school organization. The last straw was RSD Superintendent Patrick Dobard’s decision to fire Cohen’s principal, his staff and several teachers who students say they had grown to love and look upon as members of their Cohen High School family. Students say that decision, coupled with Dobard’s unilateral decision to turn over governance of Cohen’s 11th and 12th-grade classes to FIN was the final straw and prompted them to walk out and refuse to return to class until a list of demands were met. Student Demands appear basic and reasonable to some, while unacceptable to others. As a community organizer I wore my Peace Keepers shirt and spent the entire day with the students, parents, and other organizers. Monday October 8th was probably the coldest day since last winter. At 8:00AM students braved the cold in their school uniforms prepared for class they anxiously gathered around the front door of their school to hear the decision of school administrators. When administrators offered access to the building but failed to address their demands, students refused to enter. Administrators retreated to the inside of the building and soon returned to offer the protesting students access to the school’s library to escape the cold. Students declined the offer. Some began chanting “NO, NO. WE WON’T GO.” They all laughed at the imitation 60’s chant as I realized they had no idea of how similar they were to the movement of the 60’s. During the half hour we lingered in front of that door, students selected five facilitators. We decided to shift our headquarters to the corner and warmth of the sun. One of the adults suggested we get chairs from the school for the students to sit. As I walked with him to request the chairs we were met by Dana Peterson, one of Dobard’s assistants. We asked him who we would need to speak with to get the chairs. He said “They will probably say no.” I asked Peterson why they would say no to chairs when they invited the students into the library earlier. He replied “That was to get them into the school. He became irritated as I charged “You mean you were using the warmth of the library to lure the kids into the building?” He appeared irritated at my charge and said “You can phrase it however you want to.” As he turned and started to walk away we noticed students walking out of the school with stacks of chairs to bring to their classmates. He then relented “Obviously you can” as he stormed away. As the day progressed more parents and organizers began to arrive. Later neighbors, Cohen alumni and other concerned citizens joined us. More puzzle pieces were discussed. Some questioned why would this RSD superintendent sell these Cohen High School juniors and seniors to FIN? Others theorized; FIN has acquired John McDonough High but fell short in their commitment to enroll 300 students as their current enrollment is closer to 100. By acquiring Cohen’s 120 juniors and seniors FIN gets closer to the needed 300 students although the students would remain housed at Cohen they would be added to FIN’s head count which would bring FIN closer to their million dollar payday. Several retired teachers arrived to hold class with the students who were eager to resume the process of learning. Around noon the students, who were amazingly well disciplined and controlled, were obviously growing cold, tired, hungry and confused. We all were. But much of the student’s confusion was intensified by administrators planting false seeds into their minds as they attempted to turn the students against their adult supporters. Chad Brousard introduced himself to organizers as a Breaux Bridge resident who was brought in as principal of John McDonough and later shifted to Cohen. Brousard began with what sounded like a canned speech about students exercising their rights to protest as our ancestors had done… he said he wanted to speak with the students in small groups. We asked in the spirit of transparency if he would speak with them as one group, they were all assembled just a few yards away in front of our faces. He agreed to do so but turned back as we approached the students. We later found that he had somehow managed to get a few students into the library and had them sitting at a table writing out a list of demands. We asked administrators if they planned to feed the student’s lunch. They said the students were welcome to eat lunch inside, in the school cafeteria. The large majority of students declined the invitation. Adult supporters hurriedly worked it out and bought food and drink for the children to eat. A group of seven or eight boys huddled near a car decided to break ranks with their classmates. They walked around the other students and headed to the door. One of the teens tapped Brousard who was standing near the door who immediately followed them inside. After a half hour another organizer and I went into the school library where we found some of the boys seated while eating doughnuts. A group of FIN teachers were lounging on the other side of the room. The students told us they had gone inside the school because they were concerned and wanted to study for the test they would soon have to take in order to graduate. My colleague then demanded the teachers to relinquish their seats and to begin the process of educating the students. They hurriedly complied. As the cameras assembled for the scheduled 3:00PM press conference a woman (some say she was an obvious provocateur) was sent to disrupt by accusing an organizer of betraying the students by working for the RSD. Again the awesome students held their composure and proceeded with their press conference as scheduled. Many of the students remained seated and composed after the press conference because they intended to remain for the RSD scheduled meeting with parents and students. A newly fired Cohen teacher became emotional when he spoke. He said “I was hired on Friday, my first day was Monday, I was evaluated on Tuesday and fired on Wednesday. Students later rushed over to embrace their teacher and assure him that everything will be alright. The meeting ended abruptly when many of the frustrated students stood up and angrily walked out. I found it ironic that in today’s world with all of the anti-bullying campaigns that a school system would so BRUTALLY BULLY children placed under there care.